Legendary boxing commentator Larry Merchant often referred to boxing as the “Theater of the Unexpected”. You never know what is gonna happen when 2 fighters step inside that squared circle to do battle. When a fighter steps through those ropes, they risk serious injury or even death. Some fighters end up not leaving the ring the same way they came in. This unfortunately was the case for former Middleweight champion Gerald “G-Man” McClellan. McClellan was an all action, hard puncher with knockout intentions on every punch he threw. He was one of the most exciting fighters to watch in the early 1990’s until one night in 1995 when his boxing career and life were changed forever. 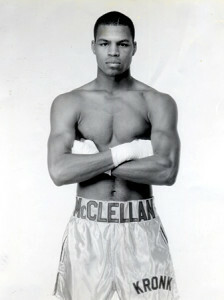 McClellan was born and raised in Freeport, IL and had a very successful amateur career before turning pro in 1988. Trained by Hall of Fame trainer Emanuel Steward, McClellan went on a rampage winning his first 10 bouts, all by knockout, not going past two rounds. He got his first taste of defeat in 1989, when he lost two fights back to back by decision; however it didn’t have any negative effect on the “G-Man“. He would go 12-0 over the next two years, 10 by knockout before getting his first world title shot against the very hard hitting John “The Beast” Mugabi. They met on 11/20/91 in London where Mugabi had been in with some of the best throughout his career, however McClellan made easy work of Mugabi, dropping him within the first 30 minutes of the fight. McClellan kept up the attack and eventually stopped Mugabi at 2:51 of the first round. He would win his next four bouts, all by knockout before getting another shot at a world title; this time it was against another very experienced and hard hitting fighter in Julian Jackson. They met on 05/08/93 in Las Vegas. Jackson came into the fight as a 2-1 favorite, however McClellan proved the oddsmakers wrong by rocking Jackson in the first round with hard shots and immediately dictating the pace of the bout. Jackson would regain his composure and rock McClellan in the second. McClellan weathered more hard shots in the third while landing some hard right hands shots of his own. In the fifth, McClellan would land a huge left hook followed by two rights that put Jackson down. Jackson would get up and McClellan went in for the kill and would drop him again before referee Mills Lane stopped the bout. A convincing win for McClellan and he was now a two-time world champion. He would successfully defend his title three times over the next year, all by knockout including a first round destruction of Julian Jackson in a rematch in May of 1994. He was at the top of his game and he then decided to move up to Super Middleweight to get bigger fights, however his career and life was about to take a tragic turn. He would face WBC Super Middleweight champion Nigel Benn in Benn’s Hometown of London, England on 02/25/95. Their bout was one of the most anticipated bouts of 1995. A huge pro-Benn crowd packed the London Arena and over 17 million fans tuned in all over the world to see this much anticipated showdown. McClellan was a huge favorite going into the bout and was confident he could knock Benn out in the first round. McClellan came out landing hard shots going for the quick knockout. He would knock Benn through the ropes in the first round and was very close to ending the bout as he predicted. The very durable Benn regained his composure in the second and began landing hard shots of his own. In the third, the hard punching McClellan turned boxer and began pumping out a hard left jab to set up hard right hands. By the fifth round, McClellan began to get winded as his mouthpiece was hanging out of his mouth. Benn was in control of the fight going into the eighth, when McClellan turned the tide by landing a huge haymaker that put Benn on the canvas once again. Throughout the course of the bout, McClellan had taken a lot of hard shots and they finally took their toll in the 10th when McClellan took a knee after a barrage of punches. He would take another knee moments later and decided to stay down for the count. It was a huge upset win for Benn. While sitting on his stool, McClellan began wincing badly. Moments later, he collapsed onto the canvas. He was taken to the hospital where it was discovered he had a blood clot in in his brain, which required an immediate operation. He suffered extreme brain damage in which he was in a coma for 11 days. He would also lose his eyesight completely, became 80 % deaf and was also unable to walk without being assisted. Today, he is under the care of his 3 sisters who assist him with his day to day activities. A non profit organization called Ring 10 was setup to assist former fighters like him and by providing assistance for food and other necessities. In 2012, McClellan had his colon removed which stemmed from his brain condition. His record as a professional stands at 31-3 with 29 KO’s. He is ranked 27th by Ring Magazine on their list of the 100 Greatest punchers of all time. From a boxing perspective, it was a career that was cut way too short. Who knows how his career would have turned out had he not suffered the injury against Nigel Benn. He more than likely would have won more world titles and possibly could have had classic battles with the likes of Roy Jones Jr, Bernard Hopkins and James Toney. He is now faced with a day to day battle more important than any battle he ever faced in the ring. Our hearts go out to him and his family.